Degree in Electronics Engineering or Instrumentation Engineering from a recognised university or institution. A recognized Medical qualification included in the first or second Schedule or Part-II of the Third Schedule to the Indian Medical Council Act, 1956 and Post Graduate Medical Qualification in Anaesthesia. Bachelor’s degree in Pharmacy with 1st class, or Master’s degree in Pharmacy with 1st class Registration as Pharmacist under the Pharmacy Act, 1948. Masters Degree in Fisheries Science from a recognized University OR M.Sc. in Zoology/Marine Biology with specialization in Fisheries from a recognized University. 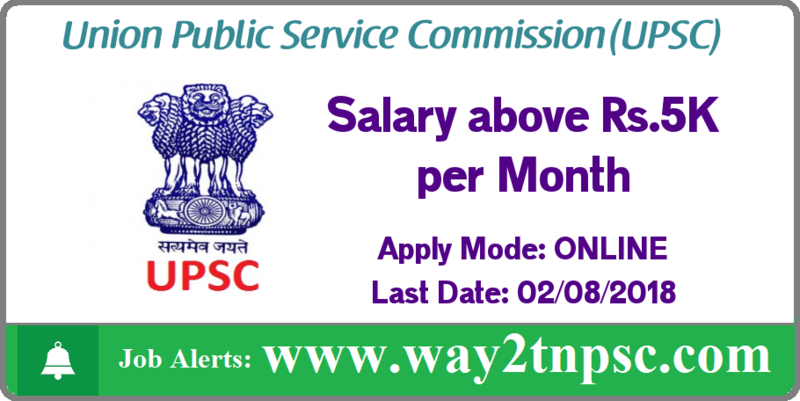 Click the FACEBOOK ICON below To get Alerts of All Job Notifications from WAY2TNPSC Interested and Eligible Candidates can apply before 02-Aug-18. Keep on reading this page to know all the above details. So, it will be helpful to know the procedure and details for the candidates who wish to apply for this particular vacancies. The above Notification ( UPSC Recruitment 2018 for Lecturer, Engineer posts | Apply online ) briefly describes about the details of latest announcement or notification includes important dates like release date , last date of application submission, details regarding fees, exam timings. Candidates, check all the needs and apply accordingly.